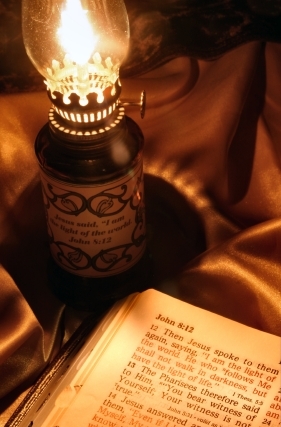 Oil in the Bible is equated to the Holy Spirit. The lamp is our soul. Matthew 5:14-16 Do we have the oil of the Holy Spirit that brings the true light and life of Christ within us; our guarantee we are His? Christ Jesus is coming for His Bride; those who are ready to be united to Him in truth and spirit. Like an earthly bride, there are preparations required. We need a spirit prepared to be united to Him. We look to the Bible for our answers. 2 Corinthians 5 is a helpful chapter on the evidence one should experience in their lives when they have the Holy Spirit. First, you are taught by God. God Himself prepares your soul for Him. (vs. 5). Jesus is the Word. It’s the Word that sanctifies you. John 17:17 This preparation of God entails you diligently abiding in the Bible, the Word, and seeking the Spirit of God to instruct and teach you in who He is, in truth and your union with Him. John 6:45, 1 John 2:27 It’s allowing the truth to penetrate your life in molding, changing and setting you apart for Christ. He teaches you and His truth starts abiding in you altering your life. Third, you fear God. (vs. 11) When the Holy Spirit dwells within you, you fear God in all areas of your life. You feel very accountable to Him, like a good child to a parent or a faithful employee to a tough boss. No one else has to hold you accountable to the things He tells you because you fear Him. Yes, others can point out your blind spots, but to what God has told you, you possess a strong will to do what God says out of a fear of going against Him. When HE tells you to do something you do it. Though you may have to war against you rebellious sinful flesh, the desire in your deepest self is to do what God has asked of you. It’s a desire to be obedient; therefore your choices will reflect that obedience. What you do will also be driven by love. Though you fear Him, you also know of His love for you. The course of your life shifts to align to His will. Again, you seek to know God’s will from Him and not from another because you want to be sure you are walking in truth and what HE desires, not being led astray by your own heart or someone else. Fourth, you are a new creation. (vs.17) You start experiencing a deep change within. It feels like you’ve been given a new operating system that governs your body and soul. As a new creaiton, you are directed by God’s spirit and no longer your self-will. As the body and soul respond to the new operating system, you start to think, act and feel differently. Your desires change. Above all, your will longs to be in unison with God’s will. Fifth, you experience fruit of the Spirit (Galatians 5:22-23). The fruit of the spirit is love, joy, peace, longsuffering, kindness, goodness, faithfulness, gentleness, and self-control. Because these are fruits of the Spirit, it comes from the Spirit and not your self-imposed efforts. The occurrence of these fruits in your life comes from a place beyond yourself and what you use to know and do. So are YOU ready by these measurements? IF NOT, FEAST upon the pure bread of heaven; the Bible taught to you by the Holy Spirit. The Holy Spirit is the spirit of truth. Seek the truth from Him as you abide in the Bible. Read with the motive to know God and to draw near to Him as someone you love in truth and spirit. This seeking and abiding is the path to being prepared for the soon coming Bridegroom. The manifestation of all these points is a process. Though you may feel a lack in some of them, are you growing in them? Are you experiencing them more today than three months ago? Are YOU diligently seeking God or are you leaving the seeking up to someone else, to only live off their efforts? It doesn’t work that way. The wise virgins couldn’t give their oil to the foolish ones. And when the foolish ones came back with their oil, the door was shut. Are you ready with your own oil? Categories: End Times, Relationship with God | Tags: Belief, Bible, Bride, Christ, Christ Bridegroom, Christianity, End Times, evidence of spirt, Faith, faithful, fruit of spirit, fruit spirit, God, God's Bride, Holy Spirit, Jesus, Judgment, parable, Spirit, Spiritual, ten virgins, truth, Word, Word of God | Permalink.